You are invited to visit and use our mobile sauna / battery factory. Inside you will find others relaxing and sharing ideas about pressing issues of our day in a moderated yet free-flowing conversation. Join in or simply listen. The combined energy of burning wood and intellectual discussion will produce abundant sweat. Pending your permission, our trained staff will gather that sweat and transform it into the active ingredient in an electrical battery. This hand-made ceramic battery will be produced on the spot, stored in a special container, and preserved for The Emergency. Your sweat equity will mingle with the sweat of others and be stored as potential energy. Emerge refreshed, doused with water, relieved of your stress, and prepared for tomorrow. 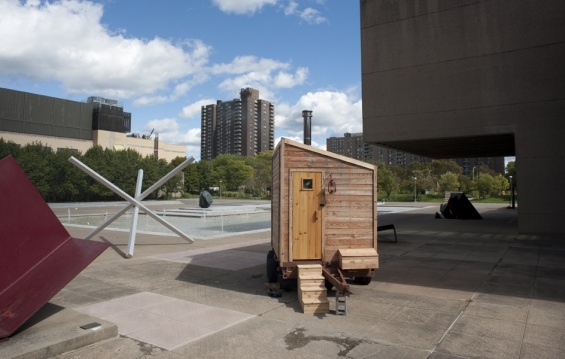 The sauna used in the program is a Mobile Sauna parked on the streets of New York. This program is part of The Canary Project’s Modern Primitive Exchange: Design and Ideas for Living through the End Times in collaboration with the DS Institute, which built and designed the Mobile Sauna. Trees will also be planted to offset the wood burned during the performance.